I recently had the pleasure of visiting artist Carmen Herrera at her home/studio in New York, where she has lived for the last 40 years. It was June 4, just a few days after she’d celebrated her 100th birthday (May 31) at a local restaurant with a small group of colleagues, family, and friends. 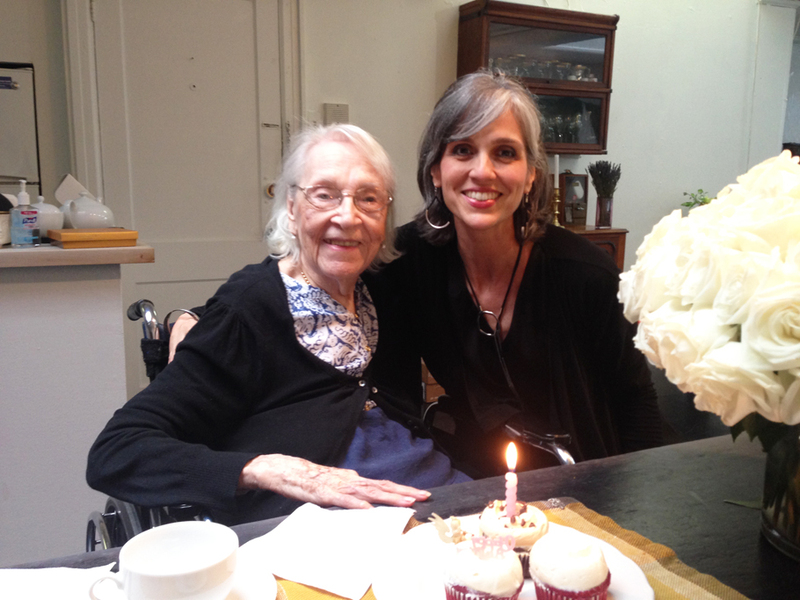 While I regrettably had to miss the festivities, we shared tea and birthday cupcakes I’d brought her from Magnolia Bakery. We were accompanied by Carmen’s longtime friend and neighbor, the painter Tony Bechara, a passionate champion of Herrera’s art since the 1990s and the man the artist’s late husband, Jesse Loewenthal, entrusted with preserving and promoting Herrera’s art. Although based in New York on and off since the mid-1950s and working in close proximity to American painters Leon Polk Smith (a friend) and Barnett Newman, Herrera and her art remained in relative obscurity until 1998. That year, New York’s El Museo del Barrio, where Bechara served on the board, organized a small exhibition of black-and-white paintings from the 1950s. Shortly thereafter, prescient collectors Agnes Gund and Ella Cisneros began to acquire and exhibit Herrera’s paintings. The story of Herrera selling her first painting in 2004 at age 89 has been the subject of innumerable stories and profiles since then, including a recent article focused on elder women artists who found recognition later in their careers (published in the New York Times’ T Magazine this spring). The centenarian’s career is now markedly on the rise. Subject of a new documentary, The 100 Years Show by film director Alison Klayman (premiered at Toronto’s Hotdocs festival this April), Hererra’s career will be highlighted in a survey exhibition, organized by Dana Miller, at the Whitney Museum of American Art in 2016. Represented by the Lisson Gallery in London since 2012, Herrera’s works are now in the collections of the Walker Art Center, the Whitney, the Museum of Modern Art, Tate Modern in London, and the Hirshhorn Museum and Sculpture Garden in Washington, D.C. I was first introduced to Carmen Herrera in the mid-2000s through Ella Cisneros, the Miami-based collector and founder of CIFO Foundation, on whose curatorial advisory counsel I sat at the time. It was in Ella’s foundation office that a painting by Herrera caught my eye. Shortly thereafter I arranged the first of several visits to the painter’s studio, and in 2007 I acquired a painting directly from the artist for the collection of the Hirshhorn Museum and Sculpture Garden, where I was the director. The Hirshhorn’s Rondo (Blue and Yellow) (1965) is a circular painting—one of a handful of tondos from the period with characteristically crisp flowing lines that define volumes of geometry and space in perfect counterbalance. I installed the painting in the Hirshhorn’s collection galleries in the company of other American painters of the 1950s and ’60s, including Ellsworth Kelly, with whom her works have strong association. Indeed both artists spent their formative years in the late 1940s and early 1950s in Paris, each maintaining a commitment to hard-edge abstraction at a time when other American artists were exploring the more gestural approaches of Abstract Expressionism. Upon returning to New York in the mid-1950s, Ellsworth Kelly and his paintings took some time to capture the art world’s imagination, while Herrera found little or no support as a woman in an art world less hospitable to female artists. It was a revelation to see Herrera’s canvas hanging in the Hirshhorn’s galleries in dialogue so fluidly with an unacknowledged peer. Shortly after arriving at the Walker Art Center in Minneapolis, I similarly sought to bring one of Herrera’s impressive structuras (structures) into the collection. I thought that one of the artist’s painted wood constructions would forge a powerful dialogue with the minimalist paintings and sculptures that are core to the Walker’s collection of abstract and minimalist works of the 1960s. In 2010, Untitled (1971) entered the Walker’s collection along with three related works on paper from 1966. 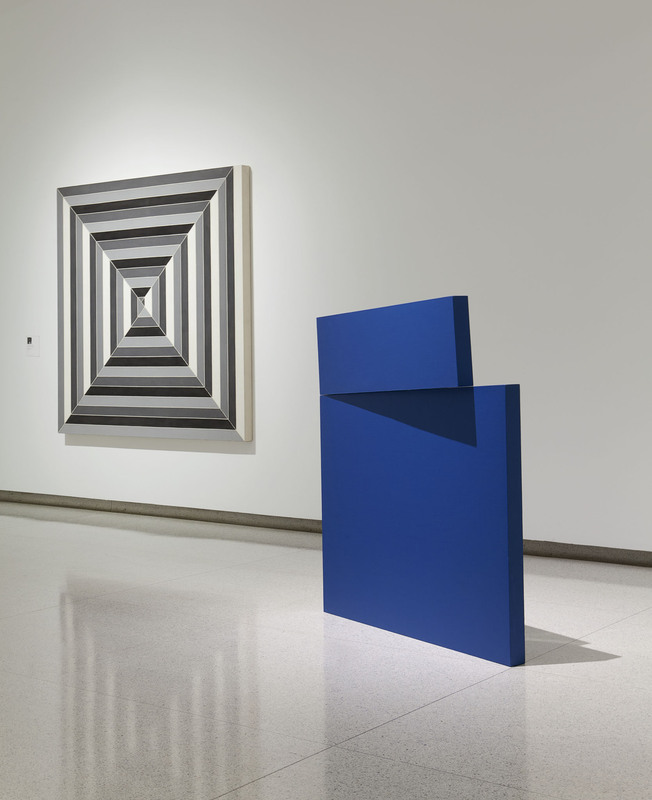 The freestanding blue construction is currently featured in the Walker’s Art at the Center: 75 Years of Walker Collections, where it is installed in the company of Frank Stella, Ellsworth Kelly, Donald Judd, as well as British painter Bridget Riley, where it equally commands the galleries. First conceived in 1966, Herrera realized the Walker’s blue structura in 1971 with the support of the Cintas Foundation, a Cuban American private philanthropic foundation that supports Cuban artists living and working in the US since the late 1950s. 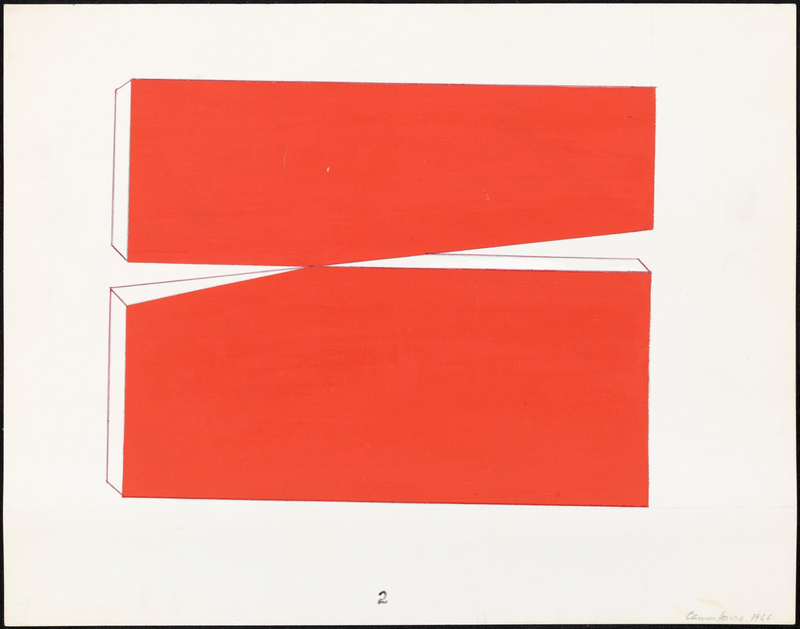 With this modest grant, Herrera found a carpenter to help her produce a group of wall- and floor-bound works in relief, including the Walker’s Untitled (1971). The funds also allowed her to help a family member leave Cuba in the years immediately following the Cuban Revolution. Affixed to the floor, the piece is comprised of two separate hollow wood-framed panels. The top panel sits on top of the bottom panel and swivels forward ever so slightly. When lit with gallery lights from above, the top panel casts a defining shadow across the bottom panel to give it its signature shape and form. While Herrera intended to make complementary pieces in red and green based on the related drawings in the Walker’s collection, only the blue structure was realized. More recently Herrera fabricated the red structure based on the Walker’s drawing and may realize others. While in New York I also visited the Whitney Museum and was delighted to see Carmen Herrera featured in the museum’s opening installation with a large painting from 1959, which recently entered the Whitney’s collection. This work is one of Herrera’s signature “green and white” paintings that have been a staple of her career. Installed next to Ellsworth Kelly, this striking juxtaposition reinforces Herrera’s pioneering import in the history of American abstract painting and affirms that her reinsertion in the history of this art is now complete.